Who doesn’t love Autumn? With leaves morphing through the full spectrum of warm colors, a refreshing crispness in the air, harvest foods to enjoy – what’s not to love? Grass. Yes, grass. This morning grass had taken the charm out of Fall for me (and that’s saying a lot, given that Fall was formerly my favorite season, tied with Spring and Summer, with Winter not far behind). As yard-owning Americans (who try to green it with native plantings, a vegetable garden, etc.) and parents of three sons who trample it endlessly, ripping it to shreds with their bikes and constant romping, my husband and I have re-entered the realm of Trying to Grow Grass. If you’ve hung out with us or own a Tender Sapling textile product with the green sapling logo on it, you know we love growing wheat berries as an indoor grass project with the kids. We even detail how to do it on the accompanying Tender Sapling theme activity tag. But that’s the easy, fun grass to grow. The kids don’t muck in it. And it doesn’t turn to swirls of mud around our house if it bombs. If you’ve never grown grass before, be warned: It’s not as easy as it looks. Especially if you want to do it as eco-friendly as possible, avoid constantly yelling at the kids to keep off the grass, and actually make it grow. Take today. The timer beeped every fifteen minutes for most of the day. If it wasn’t to alert me of the next step in a full day of cooking German dishes with the kids for our monthly homeschool culture club cooperative, it meant Grass. More accurately – go move the water on the grass. As you may well know, grass seed – like most plant seed – requires regular moisture to sprout. I was a whirling dervish much of the morning – spinning circles around sprinklers, dodging spray while repositioning them to water the next patch and not the house or driveway. Kinda like parenting. Yep. That’s right. Parenting is a lot like growing grass, but a ton more rewarding and enjoyable. More poetically, being a Parent is like being a Gardener. Just as a gardener cannot be a gardener without something to grow, a parent is defined as such by virtue of having a child to care for. And each Child is like a Seed – a powerhouse of promising possibilities, which lay hidden for the individual and its lucky parents to discover over time. And like a seed, each child needs the right conditions and care to reach his potential. A seed gradually opens. First a sprout. Then a seedling. And finally evolves into a tender sapling. The stage of a sapling is crucial. It’s a make or break time that can determine its future. It’s a time when the tree can develop a solid root system, branch out, and grow strong and straight. Or it can suffer irreparable damage. A lack of the proper amounts of sun, wind, water, and fertile soil can stunt growth or worse. Left alone in the wild, a tree can easily endure hardships that can deeply affect it for life. But at the hand of a loving gardener, the tree can flourish and achieve its full potential. Same with a child. During those early years of childhood, a parent is responsible for meeting the changing needs of the child. Like a gardener, the parent tends to the child, fulfilling his materials needs – food, water, roof over the head, clothing — and his spiritual needs — ensuring the right balance of love, mercy, freedom, and guidance for that particular child. Just as each sapling has its unique needs based on its genetics, environment, and so on, each child does too. 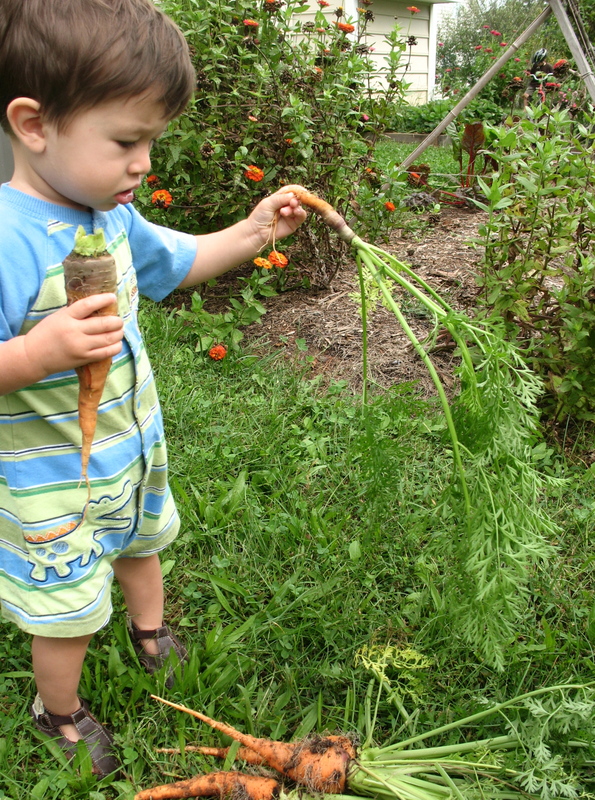 Parenting like a gardener is truly a balance of nature and nurture. It’s helping each child grow into the best it can be. As gardeners, we parents have the awesome responsibility to care for the tender saplings we’ve been entrusted to raise in this world. We strive in our daily actions, our words, and our thoughts to do our best. And, like gardeners, we get dirty in the process. Very dirty and tired and worn emotionally thin. And our work is never done. But we parents have the blessing of being there to help form, shape, and bear witness to the uniquely beautiful trees our saplings grow into over many years. Sure, we also see them at their worst, but that’s part of the package. If it were not for the bitter, how would we taste the sweet? If daddy hadn’t been kicked where it counts during the wrestling match, how could we appreciate that child’s extra butterfly kisses on his daddy’s cheek at bedtime to make sure he felt all better? It’s a little known fact that grandmas earn in-service credits by warning us rookie parents that the time will fly. And they kid us not. Suddenly, we are attending a high school or college graduation, a wedding or other hallmark moment of young adulthood. And in that moment, we taste the composite sweetness of years of parenting our sapling and realize that before us stands a mature tree that is our child all grown up. There are as many parenting styles as there are parents, just as there are different schools of gardening. But no matter what approach he or she takes, a gardener is present in the moment, as she tends to her sapling. She may keep in mind the inevitable growth that lies ahead for that sapling, but in order to meet its current needs, she must observe and listen carefully. By mindfully engaging in the present, the gardener can best serve the tender sapling. So it is with us parents. The idea of the mindful gardener hits home for me. I absolutely love the gift of being a gardener to my saplings. But there are those days, those moments, when my focus shifts to my kids’ imperfections. You know those times – when we parents are overwhelmed by the test of the moment. When we expect our sapling to already rise up high in the sky, living up to an unrealistic expectation. Or maybe I wonder why my maple sapling isn’t more like a magnolia. That’s when I try to find my gardening hat and remember: The tender sapling of mine that’s shaking in the wind (instead of sitting still and eating his spinach or looking me in the eye and telling me truthfully the story behind his latest mischief) is living fully on his own special path from a seed into a mighty tree. Is there something I can provide or suggest to aid his growth right now? What virtue is he working on and how can I facilitate its development? Or might I just need to stand back and let him experience the windstorm and then reflect together on it once it has passed? On days like today, I try to sing myself a funny diddy to keep my gardening outlook mindful and a smile on my face when the kids are in the throes of growing up. Like the moment I came out of the bathroom to behold the toddler emptying bags of walnuts onto the floor. The timer beeped again and I ran back out to move the sprinklers one last time. This time I let myself enjoy the beauty of the work at hand, letting go of annoyance with the grass growing chore and instead feeling grateful for the blessing of a yard that enables my kids to roam, explore, and discover so much about the world and themselves. Back inside, I continued my sprinkler dance, dodging and moving with the flow. Gardening my tender saplings. Categories: Virtues | Tags: children's development, gardening, growing grass, Mindful parenting, nature vs. nurture, Tender Sapling, virtues | Permalink. Yes, this is such a beautiful analogy and so true. Thanks for the wonderful insights.